Launched in April 2017 by ProgressPlay Ltd, Schmitts Casino is, well, it’s a bit weird. That’s not necessarily a bad thing, everybody needs a little weird in their life sometimes, and with countless online casinos that are almost clones of each other dotting around the internet, it’s somewhat refreshing to find a site that feels different. That being said, it takes more than a leftfield tone to guarantee success in what is one of the toughest markets in the world to crack, and every new casino, Schmitts included, needs to bring a huge amount to the table simply to have a chance of being in any way competitive. Schmitts is a German run casino, and the stereotypical efficiency of that European nation is on full show here, with top-quality customer service, speedy pay-outs, and varied deposit methods. Essentially, Schmitts Casino does everything right, but there’s have been a lot of online casinos that did the same who have not seen the success they perhaps deserve. Schmitts Casino needs some good fortune, but it also needs good content, so, how does it weigh up against its competitors? On first glance, Schmitts Casino is intimidating. This seems like an odd word to choose when describing an online casino, but if you visit, you will understand. You are met by a pretty, young man, who is staring directly at you with an expression that is best described as emotionless, it’s genuinely disconcerting. Not aided by the huge, extravagant building in the background that does not take away from the general sense of intimidation here. You may think this is a bad thing, but actually, there’s something genuinely likeable about this casino. It has a very serious attitude towards its content, but so do many online casino lovers, and there are enough sites offering fun and bright colours. To find a site that takes itself a little more seriously is something of a breath of fresh air, especially when it is executed this well. 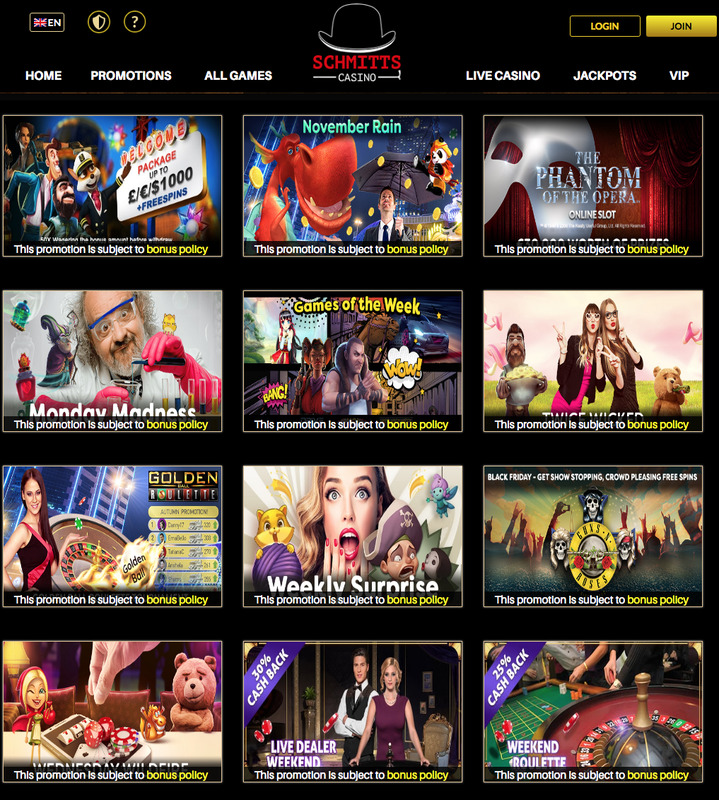 On top of this, Schmitts Casino is also remarkably easy to navigate, thumbnails will take you to popular games at the site, all sections are clearly marked (as long as you speak German or change the language) and everything is simple to find. There was a time when a new online casino would get a certain level of benefit of the doubt from players, perhaps be allowed time to build up a decent selection of games, but that is no longer the case. With so many options available to players, you need to start big or you may as well not start at all, and with titles coming from the top-quality software developers such as 1X2 Network, Blueprint Gaming, ELK Studios, Microgaming, NetEnt, NextGen Gaming, NYX Gaming, and Thunderkick, Schmitts Casino certainly starts big. New slots like Butterfly Staxx, big names including Jurassic World, and classics like Rainbow Riches can all be found in the slots offered at Schmitts Casino, while table and card game lovers will also be happy with the selection. On top of that, there’s a host of jackpot titles for when you’re feeling lucky. Schmitts Casino just does things a little differently, and that may have been a risk, but it is one that has undoubtedly paid off for this casino, which is well worth checking out.